You’ve probably noticed some name changes recently throughout town! Starting in 2017 our program received our designation as a Main Street Program under our parent company Heritage Ohio. Through Heritage Ohio we receive a advocacy, a greater knowledge base through training, and networking with other main streets that we can bring back home and use within our community! After receiving this designation our board decided to re-brand with name and logo change from the Downtown Tipp City Partnership to “Downtown Tipp City”. We will still continue with our mission of preserving, promoting, and enhancing the downtown district as a whole. Be sure to continue following us on Twitter, Instagram, and Facebook under the name Downtown Tipp City for updates, events, and pretty pictures of our wonderful downtown. There has also been a new facebook page created as a collaboration between the Chamber of Commerce, and Downtown Tipp City with input from the city and schools called “Tipp City Life”. 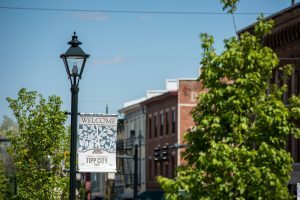 This page is going to feature Tipp City as a whole and keep you up to date on local stories, promotions, events, and just sharing in the love for our whole town. Ignite your holiday spirit on a self-guided tour of eight homes on Second Street in historic Tipp City. The tour will be a seasonal feast for your senses. Delight your eyes in every home with unique décor provided by local designers, florists and master gardeners. Hear heart-warming Christmas music as you walk about the venue. Indulge your nose and taste buds with a visit to the Trophy Nut Outlet Store. Feel the fun of the theme “Haiku Tippecanoe” woven into the festivities. Tour hours are noon to 5:00 p.m. Tickets will go on sale on November 1 and cost $15 in advance, $20 the day of the tour. For online tickets or information on the upcoming tour, visit our website at www.tippchristmasinthevillage.com or our Facebook page: www.facebook.com/christmasinthevillage. Tickets will also be available from many Tipp City merchants. Email tippchristmas@gmail.com with specific questions. Shuttle buses will take visitors between the Downtown and the tour neighborhood throughout the day. There will be a free raffle drawing for all ticket holders, so hold on to your ticket. For a sneak peak, visit the Tipp City Library during the month of November when the home histories will be on display. Immerse yourself in the beauty and excitement of Christmas and discover why Tipp City was named the Best Hometown by Ohio Magazine for 2015-2016. Proceeds from the Home Tour are donated back to the community through its many non-profit organizations who assist in making the event possible. Hello to all our fans of Downtown Tipp City. We at the Downtown Tipp City Partnership are so happy to see that you are visiting our new blog! We will work to keep this updated on the latest news, business openings and closings, downtown events, and feel good stories that happen here in the historic district of Downtown Tipp City. We are so proud of everything that happens here in our district from building improvements and restorations to business owners starting new shops along with all the programs and events we put on here at the Downtown Tipp City Partnership. So Welcome to our world and we are glad to have you be a part of it. Downtown Tipp City Partnership (DTCP) is a 501(c)3 non-profit organization and a National Trust for Historic Preservation and Heritage Ohio organization. The DTCP is the leading advocate for downtown business and property owners. We directly serve the business owners, property owners, and residents of downtown Tipp City, but our work also impacts the surrounding comunity and visitors. A healthy, active, economically strong town cneter supports stable property values, good schools, and civic involvement throughout the City, not just in the downtown area.